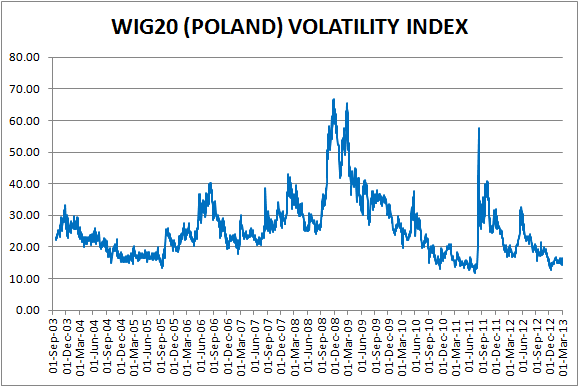 Index options based on Polish WIG 20 Index started trading in September 2003, and since then the market has matured to the point that one can develop a volatility index. The Warsaw Stock Exchange does not publish an ‘official’ volatility index, so I decided to create one and publish the data. Everyone is permitted to copy and distribute this file as long as you cite the original source. 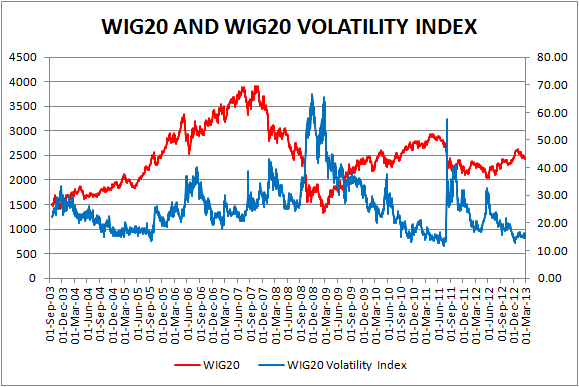 There is one academic work, ‘Emerging versus Developed Volatility Indexes’ by Slepaczuk and Zakrzewski, which does address a WIG20 volatilty index, however the authors do not provide data for their index and differ substantially in methodology from my own. I teamed up with Grant Shannon – personal friend and one of the creators of South-African Volatility Index to crunch the numbers. We followed the original VIX Whaley (1993) methodology – basing the index on most liquid ATM options, instead of the Derman et al (1999) methodology because the skew information is not particularly informative: 2012 is the sole year that the exchange listed more than 30 strikes per expiration, and option volumes actually declined from the year before. Most of the OTM options don’t trade, or trade very little – so a volatility index based on OTM options would not be robust. This is in contrast to Slepaczuk’s paper that used the Derman methodology, but had to create significant modifications to make it work for the Polish market. Using Whaley’s methodology also allowed us to create a 30-day index, just like the VIX. We believe this is also an important advantage over Slepaczuk’s 91-day index since liquidity is concentrated in near term options. 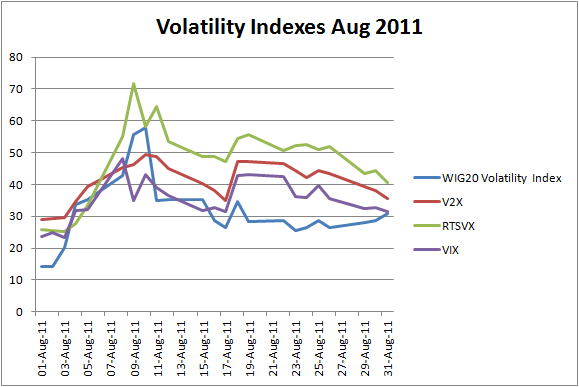 Also 30-day index allows for direct comparison with other international volatility indexes like VIX, VSTOXX and others. Grand Shannon specifically noted that emerging market volatility indices typically do not trade, i.e. they are built more for information and risk management purposes than for trading. This is a critical point because it means that there is no need to build an index that has skew built into it; a simpler model would work for emerging markets such as Poland - at the money volatility is transparent and sufficient as a starting point for risk management. The index also would be accurate as ATM implied volatility data is much more readily available in most emerging markets. In addition, an ATM implied volatility index is much more understandable too - as opposed to one that includes skew. We calculated the index from inception on September 22, 2003 to present. By the end of the week I plan to start updating the spreadsheet daily with most recent index values. My efforts to create this new series are aimed at assisting empirical researchers and interested market participants in gaining new insights into the emerging volatility space. One interesting application of the new index includes an analysis of the recent world-wide volatility spike of August 2011. On August 4th Jose Manuel Barroso, the head of the European Commission warned that the eurozone debt crisis was spreading from the smaller debt-laden nations to Italy and Spain. Italian and Spanish yields rose sharply while German yields fell. On the evening of August 5th after close of trading, S&P downgraded credit rating on USA. During the first week of August WIG20 fell from 2726.31 to 2447.21 and the WIG20 Volatility Index more than doubled from 13.36 to 35.27. On Monday August 8th most of the indexes experienced a free-fall: Euro Stoxx 50 declined 3.7%, S&P 500 declined 6.7%. ECB launched a massive buying program of Italian and Spanish debt. Volatility rose across Europe; the VIX jumped from 32 on Friday to 48 on Monday’s close where it topped out. Wednesday 10th seems to be the worst day – WIG20 fell 5% - it’s 8th consecutive down day while the WIG20 Volatility Index reached 57.74.